In her life, Gro Harlem Brundtland has served society in three distinct capacities—as a medical doctor, a politician, and an environmentalist. She initially worked as a physician and then moved into the political arena as an environmental minister in the Norwegian government. Her success in this capacity led to her election as Norway's first female prime minister and influence on international treaties and conferences. After attending medical school, Brundtland took a job with the city of Oslo as assistant medical director at the Board of Health. The opportunity to further evolve professionally came in 1974 when she joined the Norwegian cabinet as the ruling Labor Party's new environmental minister. As environmental issues grew to play a larger role in the Norwegian political arena, Brundtland's power base expanded. Her concern for the environment made her increasingly popular with many Norwegians. That popularity led to Brundtland's election as the prime minister of Norway in 1981. She became the country's first female prime minister and, at age 42, the youngest person to ever hold that office. Although her first term as the leader of Norway was frustrating and lasted only one year, Brundtland remained the leader of the country's Labor Party, and in 1986 she was reelected prime minister. In between, her leadership skills landed her an opportunity to conduct one of the most intensive studies on the future of the global environment ever undertaken. Called the World Commission on Environment and Development, this United Nations commission in the 1980s focused on solving the problems of poverty without destroying or severely depleting the world's natural resources. ©Reuters NewMedia Inc./Corbis. Reproduced by permission. Ultimately, the commission created a report, titled Our Common Future. Because of Brundtland's leadership in preparing it, the document also became known as The Brundtland Report. "The time has come for a marriage of economy and ecology so that governments and their people can take responsibility not just for environmental damage, but for the policies that cause the damage," the commission stated in its report. Brundtland's leadership on this United Nations effort helped cement her role as a leading voice in the evolving global concern for the environment. 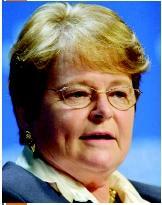 In 1998 Brundtland took office as the Director General of the World Health Organization, a position she still held in 2002. SEE ALSO E ARTH S UMMIT ; M ONTRÉAL P ROTOCOL ; T REATIES AND C ONFERENCES . Gibbs, Nancy. (1989). "Norway's Radical Daughter." Time, September 25. World Commission on the Environment and Development. (1987). Our Common Future. Oxford: Oxford University Press.